Are you looking for in Anchorage, Alaska? Cindy Weber is a licensed audiologist who has been providing exceptional hearing services in Alaska for the past 13 years. 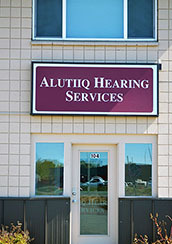 Alutiiq Hearing Services proudly offers a full range of diagnostic and preventative hearing healthcare professional services, including hearing aid screening, hearing aid sales, tinnitus treatment, hearing system cleaning/servicing and hearing testing Anchorage residents can trust.